Congers, NY (May 8, 2018) – Aktina Medical, the industry’s primary source for radiation oncology needs, today announced the introduction of its new SpiroCheck Duo® quality assurance system designed for use with an Active Breathing CoordinatorTM (ABC). Accurate to within 1.25%, the new Restriction of Hazardous Substances Directive (RoHS) compliant device helps ensure precise readings and performance of ABC systems in critical radiotherapy planning and treatment. The SpiroCheck Duo completes a full calibration of the ABC’s spirometry and balloon valve in less than two minutes to help minimize downtime. 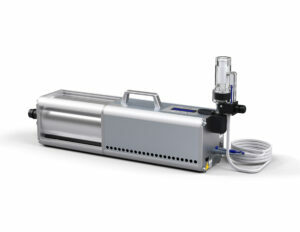 The SpiroCheck Duo features a precision machined piston with a 1-3-liter calibrated volume displace connected to a linear actuator, creating sinusoidal tidal volume. The completely automated front panel LCD screen displays all Pass/Fail test results without the need to connect the system to an ABC system for post processing data analysis. PC connectivity allows for creating and printing of QC reports. The SpiroCheck Duo is compatible with ABC versions 2 and 3.